Running is not just simply a sport of biomechanics. It requires harmony between your body and mind. Combining the principles of Ayurveda with Western medicine could help improve your overall physical and mental well being to keep you running both figuratively and literally. Your joints are essential to your running game. They move your bones with respect to each other. In order for this to happen there needs to be a firm yet flexible attachment to one another. Inside of the joint is articular cartilage which covers the bones’ surfaces. This provides an extremely slippery surface for the bones to glide across each other acting as a shock absorber. This cushion prevents your bones from impacting one another and incurring damage during weight-bearing activities like walking, jogging or running. Synovial fluid is stored in articular cartilage similar to the way that a sponge stores water. It provides lubrication and circulates vital nutrients required by the joint. Despite the strength and flexibility of cartilage, it can be damaged. Once cartilage is damaged it does not heal itself easily. When cartilage does produce new cells it is limited and often grows irregularly. Due to irregular growth, it can leave the bones susceptible to rubbing and grinding that can become a serious source of pain. Your joints are vital to your body’s mobility. Life without them is almost inconceivable and care of them can significantly improve your levels of comfort as well as performance day to day. 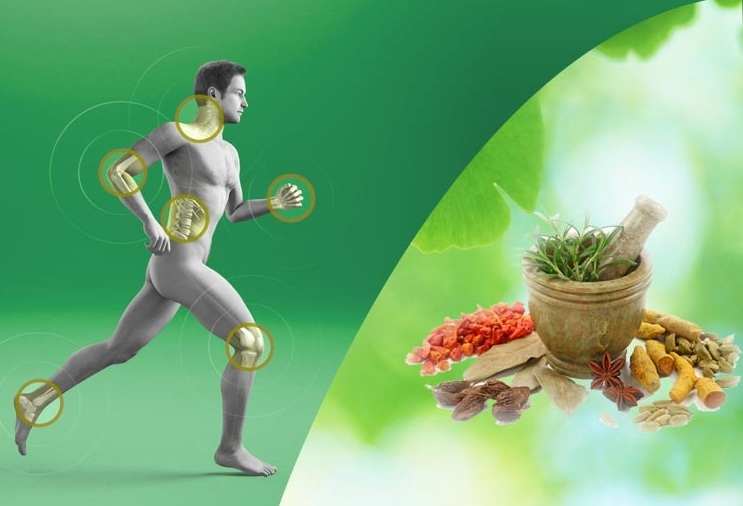 There is a combination of ways that you can maintain healthy joints by utilizing both Western medicine and an ayurvedic approach. Orthotic aids have the ability to provide the necessary assistance your body lacks as the result of injury or illness. They can also help you prevent serious injury if used far enough in advance. Orthotics are devices applied externally for use in modifying the functional and structural properties of the skeletal and neuromuscular system. Their uses are to limit, control, immobilize, and/or guide joints, extremities, or body segments to assist with movement reducing weight-bearing forces. The correction they provide to the function of and/or shape of your body could help in alleviating related pain. As a runner, the added support or correction of imbalances in alignment can have drastic results. Solutions could include using braces, arch supports and/or corrective shoes. Proper ankle supports for runners, and/or knee braces should fit snugly and provide the necessary support to help prevent new or further injury to the joints. They may even utilize compression to help reduce inflammation due to injury. Ayurveda views the bones and joints as a site of vata dosha in your body. This means that they share a relationship with and can be prone to an imbalance in vata. Since vata is also closely related to your digestion, eating foods that are difficult for your body to properly process can have a noticeable impact. Provoking vata could also be a result of eating on the fly, overexertion, lack of routine and/or poor exercising practices. Within Ayurveda, there are two major types of joint issues. The first is associated with low bone density, poor nourishment, or overall weakness in joints. This problem could start with discomfort leading all the way immobilization of the joints as a result of the bone not receiving the proper nourishment. The second is associated with an overload of toxins in the joints. When ama collects in the joints, it can create heaviness and stiffness. Ama is the toxic, sticky waste product of insufficient digestion fueled by agni and unprocessed emotions or experiences left unassimilated. Agni is the element in Ayurveda responsible for digestion, assimilation, and absorption which transforms food into energy, consciousness, and tissues. Prolonged exposure to ama can cause swelling and pain. Cold or damp weather can irritate this joint issue. Balancing vata is critical to overall joint health. The vata’s natural home is in the colon, which is why digestion plays such an important role in its balance in the body. Digestion is also crucial to the harmony between vata, agni, and ama. When there is an imbalance, the vata and ama will leave the colon and enter your circulation. In order to re-establish balance you must consider the relationship between your everyday mental health, diet, and physical health as it relates to the doshas and elements of Ayurveda. You should focus on clearing ama and vata from your joints by tending to agni in both your digestive system as well as joint and bone tissues. Doing this should help ensure the halt of excess vata and ama that could be causing problems for you. Use of orthotics combined with warm oil massages, a vata-pacifying diet, keeping a vata-friendly routine, and regular exercise could drastically improve the health of your joints. This could also restore the appropriate balance to your everyday life and keep you consistently crossing the finishing line.